I actually laughed out loud. The statement seemed a non sequitur. My immediate vision was a horde of crows picking through fast food containers and Drano® bottles, and three-eyed fish in nearby leached waterways Ã la The Simpsons. And I’m pretty sure that’s not at all what Waste Management, Inc. (NYSE: WM) was hoping to achieve by plastering this marketing factoid on their fleet. Factual it may be, but credibility lies firmly in the mind of the recipient and is a combination of the objective (facts and evidence) and the subjective (an observer’s personal opinions, feelings, bias, or intuition.) This secondary subjective bucket is where branding is firmly rooted. Brand is more about perception, than reality; and emotion, more than logic. Your brand ultimately exists in the minds of others. Beyond feeling like a disconnect in its application (prompting thoughts of endangered butterflies while a load of styrofoam enters the maw of a garbage truck? ), the landfill-as-wildlife-habitat factoid strained credibility for me. It felt like either intentionally misrepresented or manipulated data, or flat-out greenwashing. I didn’t find it credible, whether it was true or not. Before and After: A little bit of context goes a long way. “Our retired landfills provide 17,000 acres of wildlife habitat. “Preserves around our landfills provide 17,000 acres of wildlife habitat. Suddenly they go from preposterous to plausible. While some might still see these claims as lipstick on a pig, the changes represent a significant difference and a valid opportunity to communicate something about the brand’s (or industry’s) responsibility, and an opportunity for gut-checking our assumptions or bias. It’s a foot in the door. Sometimes a little nuance gives a message meaning. A couple added words in the above examples make all the difference. In addition to adding a context that supports credibility, these adjusted brand messages encourage examination and transparency by providing more specificity and a message-specific URL. These messages now would be vastly more meaningful to me, even if the data wasn’t such a large aggregate number. * While I still might have my doubts, these new messages are suddenly qualified in some way and I’m much more inclined to: (1) not immediately dismiss the claims entirely, and (2) want to know more. It just goes to show that the calibration or “accuracy” of your brand messaging can actually undermine your position, rather than enhance it. It can make you sound suspect, when before your audience was, at worst, neutral or unaware. Sometimes your factual information asks more questions than it answers. The fact is, Waste Management does have all kinds of initiatives in place to support their “green” or “sustainability” claims, not just a single pet project. Use retired landfills as opportunities to build recreational facilities like BMX tracks, golf courses, and playing fields. Keep in mind WM does these things primarily because it makes business sense, not from pure altruism. While economic performance varies with the larger market, recycling and energy generation are intended to be revenue streams of a company with more that 21 million customers and $14 billion in annual revenue. The challenge is: The only reason I currently know all of this depth of rich information—the true net environmental value of which is better determined by experts than by me—is because as a branding and positioning professional I was puzzled enough by a questionable or unqualified message claim to actually spend the time to research it for this post. The average consumer is unlikely to make a concerted effort to research and examine your claims before dismissing the message as suspect and devaluing your brand’s overall credibility. The onus is on you. And here’s the really interesting thing about this particular experience: My household is a Waste Management, Inc. customer. Their distinctive green roller bin resides in our garage. And I didn’t know much about their business model, or ultimately find their messaging very probable or plausible. That tells me they’d be better off making sure I know their meta messages (beyond their “Think Green.®” tagline preferably) rather than getting into the weeds with isolated data points that may not result in the perceptual gain and brand love they’d hoped. So what can we learn from this (in)credible messaging experience? Eight Tips for Building Your Brand’s Credibility. Think like your customer; not a glossy annual report. Stretching or restating your data to your advantage, or stripping it of appropriate context, can hurt you. Sometimes it’s better to “round down” to maintain believability. Link people to more information and deeper messaging, closing the loop on facts and perceptions. Make it easy to discover and be more transparent. Connect the dots for your customers. You are responsible for the heavy lifting. Make it easy for them to believe you. Nuance is important; it can make or break your messaging. Expert opinion or certification is only as valuable as the “experts” and their authority are credible or universally recognized by your audience. Consistency is key. You need to clearly establish your brand position, value proposition, key messages (those meta messages), and primary supporting proof points. Then diligently stick to those across your brand and marketing deployment, unless audiences are very interested and informed, when you can drill deeper. Remember: Actions speak louder than words. And perception trumps reality. P.S. Ultimately, it all adds up…or maybe it doesn’t. Credibility (and brand equity) is cumulative; you live with your brand and industry history. 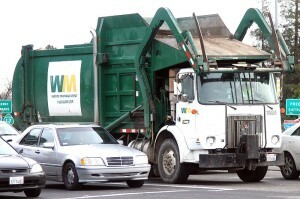 Some older consumers from larger cities, associate waste haulers with early mob involvement in garbage collection and disposal. Those familiar with the company’s history may be skeptical of current sustainability messaging because of past violations of the public trust, even if unrelated to financial fraud and even after time has passed and leadership and focus may have changed. *Interestingly, that factoid on my local truck appears to be outdated 2007 data. Waste Management, Inc.’s 2014 Sustainability Report reports, “We dedicate 27,000 protected acres to wildlife habitat.” Significantly up. Unfortunately, nowhere could I find the total aggregate number of acres that comprise their 262 solid waste landfills nationwide or what percentage this offset represents, so even with a whopping 60% increase the data is still debatable and disconnected.